Atlanta, USA-based firm Generation Orbit Launch Services has fired the prototype engine for its hypersonic flight testbed for the first time. The hot fire test of the GOLauncher1 (GO1) was conducted at Cecil Spaceport in Jacksonville, FL, at the end of the June. The test is a major milestone for Generation Orbit Launch Services (GO), which is working under contract with the US Air Force Research Laboratory (AFRL) to develop a hypersonic testbed to flight test a wide range of hypersonic vehicle technologies. GO1 is a single-stage liquid rocket, launched from a Gulfstream III carrier aircraft, that uses liquid oxygen and kerosene propellants. The system is designed to provide affordable and regular access to high dynamic pressure flight conditions between Mach 5 and Mach 8, so research and development can be carried out on a wide range of payloads. The first flight of GO1 is planned for late 2019. 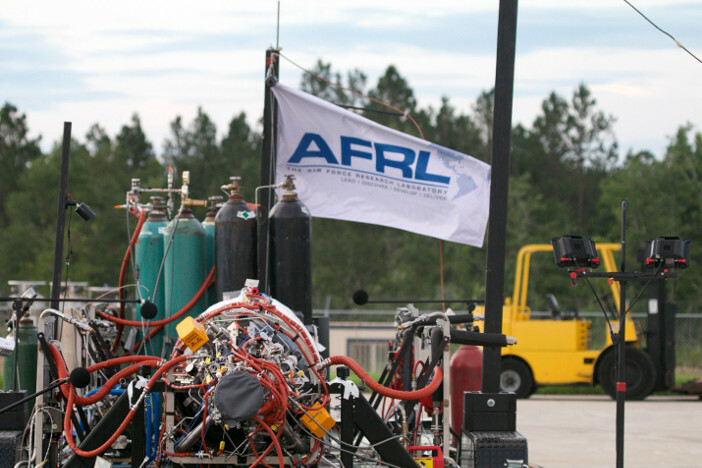 The test was the first of its kind to be conducted at Cecil Spaceport. It was also GO’s first test campaign to use Ursa Major Technologies’ “Hadley” liquid rocket engine. The 5,000 lbf-class oxygen-rich staged combustion engine performed as expected through the tests. Building up a series of cold flows and engine development tests, the test demonstrated integration of the engine with propellant tanks, valves, the pressurization system, and flight controls. The test also demonstrated the throttling capabilities of the system to the thrust levels required for Mach 6 cruise at 80,000 to 90,000ft. This feature is a key enabler of GO1’s hypersonic flight testing capabilities. Chief executive of GO, AJ Piplica, said, “The successful testing of this GO1 prototype is a huge milestone. “Completing a full end-to-end integrated system iteration prior to the completion of the vehicle design has allowed us to learn a massive amount, not only about how the system works, but also on the manufacturing and operations fronts. The Air Force Research Laboratory’s program manager for GOLauncher1, Barry Hellman, said, “The rapid prototyping of a new hypersonic flight test capability being done by Generation Orbit has been exemplary. It will provide us with a capability to conduct routine hypersonic testing with a system that can be tailored to many technologies. Cecil Spaceport Director, Todd Lindner said, “The successful completion of the Hadley liquid rocket engine test by Generation Orbit and the Air Force Research Lab serves as a milestone for Cecil Spaceport and demonstrates the validity and capabilities of the Cecil facilities and Generation Orbit.